Try it out! Do a search for “ixabepilone AND endometrial” for example. This will return a table of 4 clinical trials (or it did on 2016 Sept 21) with a red button at the top right that says “Export results to XML.” If you click this button (then “I agree,” then “Export all trials to XML”) your browser will save an XML file with the results in it. LibreOffice has a great tool for importing XML information, like the sort you just downloaded from the WHO database. If you navigate to where your browser saved the XML file and choose it as the “Source File,” you’ll have a problem. The “Map to Document” field won’t be populated by elements from the XML file as expected. Open up the XML file in a plain text editor (Notepad, Atom, Scratch, etc.). The only difference here is that the single quotes are replaced with double quotes. LibreOffice will read the file as expected now! 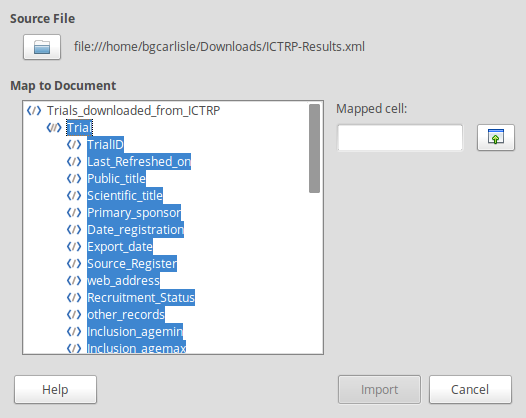 Click where it says “Trial” under “Trials_downloaded_from_ICTRP” in the “Map to Document” field, choose A1 as the “Mapped cell,” and click the Import button! 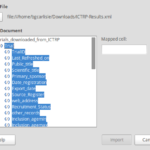 You can now read through WHO ICTRP files on LibreOffice Calc.